NASA tweeted a reaction to the news, offering its condolences. 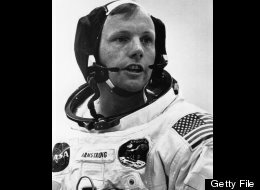 CINCINNATI (AP) — Neil Armstrong was a quiet self-described nerdy engineer who became a global hero when as a steely-nerved pilot he made “one giant leap for mankind” with a small step on to the moon. The modest man who had people on Earth entranced and awed from almost a quarter million miles away has died. He was 82. Armstrong died following complications resulting from cardiovascular procedures, a statement Saturday from his family said. It didn’t say where he died. Armstrong commanded the Apollo 11 spacecraft that landed on the moon July 20, 1969, capping the most daring of the 20th century’s scientific expeditions. His first words after setting foot on the surface are etched in history books and the memories of those who heard them in a live broadcast. “That’s one small step for (a) man, one giant leap for mankind,” Armstrong said. In those first few moments on the moon, during the climax of heated space race with the then-Soviet Union, Armstrong stopped in what he called “a tender moment” and left a patch commemorate NASA astronauts and Soviet cosmonauts who had died in action. “It was special and memorable but it was only instantaneous because there was work to do,” Armstrong told an Australian television interviewer in 2012. Armstrong and Edwin “Buzz” Aldrin spent nearly three hours walking on the lunar surface, collecting samples, conducting experiments and taking photographs. “The sights were simply magnificent, beyond any visual experience that I had ever been exposed to,” Armstrong once said. The moonwalk marked America’s victory in the Cold War space race that began Oct. 4, 1957, with the launch of the Soviet Union’s Sputnik 1, a 184-pound satellite that sent shock waves around the world. Although he had been a Navy fighter pilot, a test pilot for NASA’s forerunner and an astronaut, Armstrong never allowed himself to be caught up in the celebrity and glamor of the space program. Armstrong’s modesty and self-effacing manner never faded. When he appeared in Dayton in 2003 to help celebrate the 100th anniversary of powered flight, he bounded onto a stage before 10,000 people packed into a baseball stadium. But he spoke for only a few seconds, did not mention the moon, and quickly ducked out of the spotlight. He later joined former astronaut and Sen. John Glenn to lay wreaths on the graves of Wilbur and Orville Wright. Glenn introduced Armstrong and noted it was 34 years to the day that Armstrong had walked on the moon. “Thank you, John. Thirty-four years?” Armstrong quipped, as if he hadn’t given it a thought. Armstrong’s moonwalk capped a series of accomplishments that included piloting the X-15 rocket plane and making the first space docking during the Gemini 8 mission, which included a successful emergency splashdown. In the years afterward, Armstrong retreated to the quiet of the classroom and his southwest Ohio farm. Aldrin said in his book “Men from Earth” that Armstrong was one of the quietest, most private men he had ever met. Derek Elliott, curator of the Smithsonian Institution’s U.S. Air and Space Museum from 1982 to 1992, said the moonwalk probably marked the high point of space exploration. The manned lunar landing was a boon to the prestige of the United States, which had been locked in a space race with the former Soviet Union, and re-established U.S. pre-eminence in science and technology, Elliott said. “The fact that we were able to see it and be a part of it means that we are in our own way witnesses to history,” he said. The third astronaut on the mission, Michael Collins, circled the moon in the mother ship Columbia 60 miles overhead while Armstrong and Aldrin went to the moon’s surface. For Americans, reaching the moon provided uplift and respite from the Vietnam War, from strife in the Middle East, from the startling news just a few days earlier that a young woman had drowned in a car driven off a wooden bridge on Chappaquiddick Island by Sen. Edward Kennedy. The landing occurred as organizers were gearing up for Woodstock, the legendary three-day rock festival on a farm in the Catskills of New York. Armstrong was born Aug. 5, 1930, on a farm near Wapakoneta in western Ohio. He took his first airplane ride at age 6 and developed a fascination with aviation that prompted him to build model airplanes and conduct experiments in a homemade wind tunnel. As a boy, he worked at a pharmacy and took flying lessons. He was licensed to fly at 16, before he got his driver’s license. Armstrong enrolled in Purdue University to study aeronautical engineering but was called to duty with the U.S. Navy in 1949 and flew 78 combat missions in Korea. After the war, Armstrong finished his degree from Purdue and later earned a master’s degree in aerospace engineering from the University of Southern California. He became a test pilot with what evolved into the National Aeronautics and Space Administration, flying more than 200 kinds of aircraft from gliders to jets. Armstrong was accepted into NASA’s second astronaut class in 1962 – the first, including Glenn, was chosen in 1959 – and commanded the Gemini 8 mission in 1966. After the first space docking, he brought the capsule back in an emergency landing in the Pacific Ocean when a wildly firing thruster kicked it out of orbit. “But there was that moment on the moon, a brief moment, in which we sort of looked at each other and slapped each other on the shoulder … and said, `We made it. Good show,’ or something like that,” Aldrin said. An estimated 600 million people – a fifth of the world’s population – watched and listened to the landing, the largest audience for any single event in history. Parents huddled with their children in front of the family television, mesmerized by what they were witnessing. Farmers abandoned their nightly milking duties, and motorists pulled off the highway and checked into motels just to see the moonwalk. Television-less campers in California ran to their cars to catch the word on the radio. Boy Scouts at a camp in Michigan watched on a generator-powered television supplied by a parent. Afterward, people walked out of their homes and gazed at the moon, in awe of what they had just seen. Others peeked through telescopes in hopes of spotting the astronauts. In Wapakoneta, media and souvenir frenzy was swirling around the home of Armstrong’s parents. He remained there until 1979 and during that time bought a 310-acre farm near Lebanon, where he raised cattle and corn. He stayed out of public view, accepting few requests for interviews or speeches. Those who knew him said he enjoyed golfing with friends, was active in the local YMCA and frequently ate lunch at the same restaurant in Lebanon. “I can honestly say – and it’s a big surprise to me – that I have never had a dream about being on the moon,” he said. From 1982 to 1992, Armstrong was chairman of Charlottesville, Va.-based Computing Technologies for Aviation Inc., a company that supplies computer information management systems for business aircraft. He then became chairman of AIL Systems Inc., an electronic systems company in Deer Park, N.Y.
Armstrong married Carol Knight in 1999, and the couple lived in Indian Hill, a Cincinnati suburb. He had two adult sons from a previous marriage.